For a long time, CCP maintained a studied silence on the subject of miner bumping. Optimistic of yet another nerf to highsec aggression, miner petitions proliferated. But the day finally came when CCP acknowledged the legality of miner bumping--the first setback experienced by the theme park movement. That was months ago, but the space lawfirms have yet to close their doors. Faye Ajzenberg had nothing to say to me while I attempted to communicate with her. Nor did she speak a word while I bumped her out of range. Upon returning to keyboard, though, she sent an indignant EVEmail. I called her on it in local. 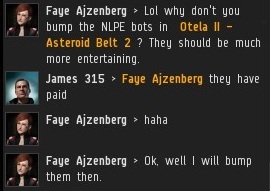 Any conversation worth having via EVEmail is worth having in the presence of a hundred random strangers in a highsec system. Faye repeated her threat to petition me. 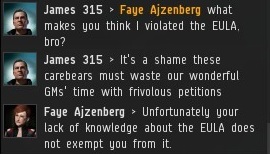 Even if the vast majority of such threats are never carried out, I remain by far the most "petitioned" player in EVE. None of these petitions have ever been granted. Faye wasn't merely a garden variety petitioner, though. Her supreme confidence in her incorrect interpretation of the EULA marked her out as a proper space lawyer. Space lawyering is not a rewarding profession, but neither is it lucrative. As such, most space lawyers are strictly part-timers. They support themselves through AFK mining, mostly. I asked for a citation of the EULA provision I was in violation of, but Faye became silent once more. 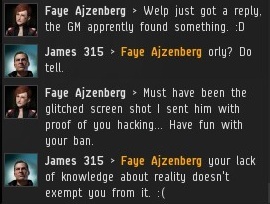 By this point, I suspect Faye had received the standard-form response from a GM, declaring the legality of miner bumping. Based on previous experience, GMs actually read most petitions within minutes--the delay only comes in their responding to them. For bumping petitions, denials come quickly, since they're dealt with on a routine basis. 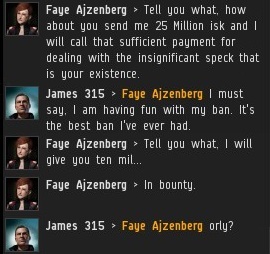 She made good on her promise, adding another 10 million isk to my bounty. Prior to the Retribution expansion, many carebears placed hope in the new bounty system as a means of destroying the New Order. Faye was retro! I have flown the same Invincible Stabber since I purchased it in June 2012. 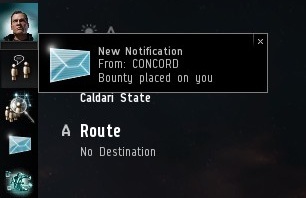 Not a single isk of bounty has been collected. 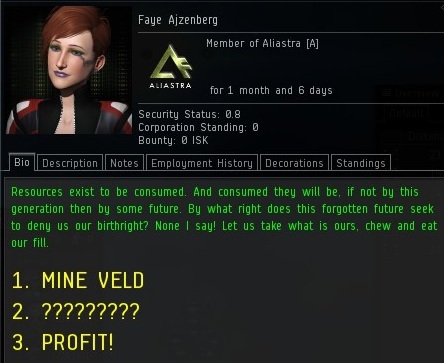 Clearly, the 10 million isk would have been better spent on a mining permit. Faye then attempted to redirect my attention elsewhere. I told her that some bots had already "paid". However, I did not say that they paid for permits; they had paid in the sense of having been bumped (and ganked) previously. Believing they were Code-compliant supporters of the New Order, Faye swooped into action, attempting to bump them out of the belt. Sadly, she was only flying a Federation Navy Comet, not suitable for bumping. But her heart was--unbeknownst to her--in the right place. She was doing the work of the New Order. Ineffectively, yes, but still doing it! And so the space lawyer was transformed into a productive citizen of highsec. Will wonders never cease? Not at this rate. "your lack of knowledge about reality doesn't exempt you from it"
Faye Ajzenberg isn't the highest-meta blaster in the proverbial station hangar. 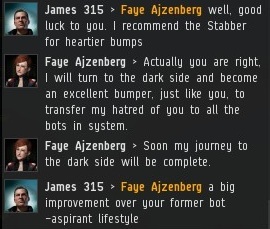 James should send Faye an evemail everyday taunting her about his "ban". If she has taken up bumping, she should be praised and supported. I enjoyed the part where she tried to cover up the fact that the petition failed by asking for ISK to let the petition go. That was quality cover up techniques there. She must be a pro. Well, at least Faye quotes CEO Nwabudike Morgan from Sid Meier´s Alpha Centauri in her Bio... gotta give her that. Alpha Centauri Civ best Civ after all! I like these stories, but for heavens sake make 'em believable. After exchange of emails the owner proposed a 'mini consultation', only to send the 'We do not provide consultation with tax education content' statement two hours prior to its scheduled commencement a month later. The receptionist came across more professional than the principal. Never heard of a "space lawyer" before i visited your site, but as a Fort Lauderdale Attorney who's interest beyond law includes NASA, I am sure some of my friends may think of me as one. Oakville Family Lawyer is one of the leading family law firms offering most trusted and friendly services for all family law disputes. Make an appointment today with a specialist Family Lawyer, Lydia Moritz and get the best solution for your family matter. Our specialist services include divorce, child custody, property settlement, and many others. This is a truly good site post. Not too many people would actually, the way you just did. I am really impressed that there is so much information about this subject that have been uncovered and you’ve done your best, with so much class. If wanted to know more about green smoke reviews, than by all means come in and check our stuff. how does minimum insurance work?